182 Beacon is located on the NW corner of Beacon and Clarendon, with 180 Beacon to the east, across Clarendon, 184 Beacon to the west, and 278 Clarendon to the south, across Beacon. 182 Beacon was built ca. 1866, one of two contiguous houses (182-184 Beacon) designed as a symmetrical pair and built for John Lowell Gardner on land which he purchased on July 16, 1860, from the Boston and Roxbury Mill Corporation. John L. Gardner and his wife, Catharine Elizabeth (Peabody) Gardner, made 182 Beacon their home. They previously had lived at 7 Beacon. They also maintained a home in Brookline. In his Houses of Boston’s Back Bay, Bainbridge Bunting indicates that 182-184 Beacon were built ca. 1866. John L. Gardner is first shown as residing at 182 Beacon in the 1868 City Directory, so it is possible that it was built slightly later. He probably had 184 Beacon built at the same time, but it appears not to have been occupied until 1870, when he sold it to Joseph Coolidge. Click here for an index to the deeds for 182 Beacon. John L. Gardner was a shipping merchant in the East Indies, Russia, and Sumatra trade. In his later years, he took a less active role in his merchant business and focused on investing in real estate. From 1879 until his death, he also served as president of the Massachusetts Hospital Life Insurance Company. The Gardners’ youngest child, Elizabeth Blanchard Gardner, lived with them until her marriage in October of 1868 to Francis Skinner, a dry goods merchant. 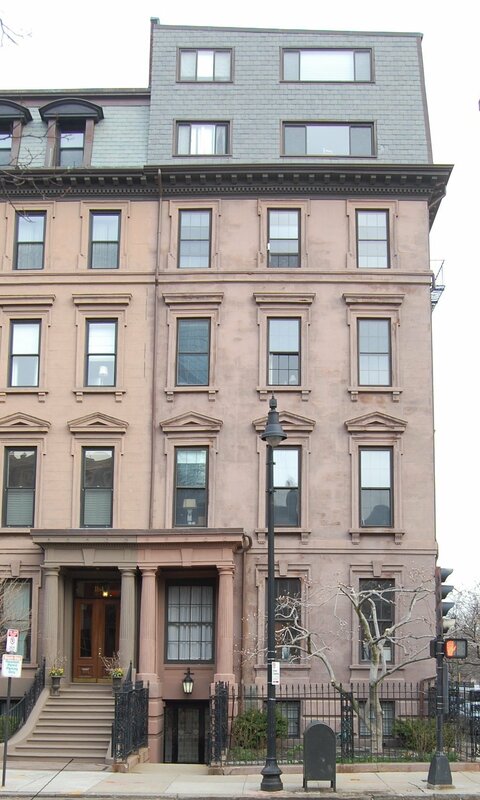 After their marriage, they lived at 140 Beacon and then briefly with the Gardners at 182 Beacon in 1871. By 1872, they had moved to 81 Marlborough. John and Catharine Gardner lived at 182 Beacon until their deaths, she in September of 1883 and he in July of 1884. On October 23, 1884, 182 Beacon was acquired from John L. Gardner’s estate by Oliver Ditson. He was a music publisher and music store owner. He and his wife, Catherine (Delano) Ditson, lived at 8 East Brookline. 182 Beacon was not listed in the 1885 Blue Book. On July 2, 1885, 182 Beacon was purchased from Oliver Ditson by Charles Allen Browne, a druggist. A widower, he previously had lived at 78 Boylston. He continued to live at 182 Beacon until his death in March of 1893. 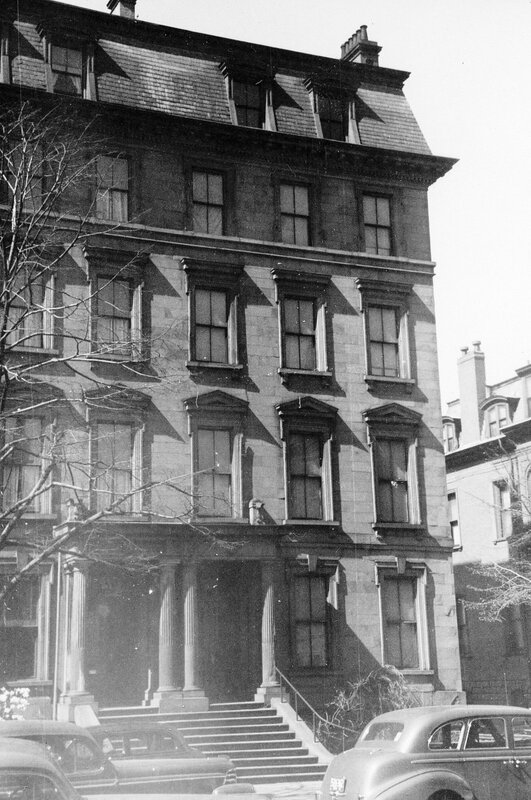 182 Beacon was inherited by his two children, Dr. William Andrews Browne, a physician, and Rebecca Andrews (Browne) Greene, the wife of Francis Bunker Greene. On March 17, 1893, William Browne transferred his interest in 182 Beacon to his sister, and it became the Greenes’ home. They previously had lived in New Bedford, where Francis Greene had been an attorney. They also maintained a home in Dartmouth. In September 13, 1911, 182 Beacon was acquired from Rebecca Greene’s estate by Abbott Lawrence Rotch, and on September 16, 1911, he transferred the property to his wife, Margaret Randolph (Anderson) Rotch. The Rotches lived at 235 Commonwealth and did not moved to 182 Beacon. Abbott Lawrence Rotch was a professor of meteorology at Harvard and founder of the Blue Hill Meterorological Observatory. He died in April of 1912. Margaret Rotch continued to live at 235 Commonwealth during the 1912-1913 season, but moved thereafter to 182 Beacon. 182 Beacon was not listed in the 1912 and 1913 Blue Books. Margaret Rotch’s three children — Margaret Randolph Rotch, Arthur Rotch, and Kathleen Lawrence Rotch – lived with her. Margaret Randolph Rotch married in June of 1916 to James Jackson Storrow, III, an electrical engineer and later trustee of his family’s property. After their marriage, they lived at 265 Clarendon. Margaret (Anderson) Rotch married again in November of 1919, to Henry Parkman, Jr., an attorney. After their marriage, they lived at 182 Beacon. Arthur Rotch and Kathleen Rotch lived with them. They also maintained a home in Marblehead. Kathleen Rotch married in June of 1925 to Malcolm Whelen Greenough. After their marriage, they lived at 20 Fairfield. On November 18, 1931, Margaret Rotch transferred 182 Beacon to the New England Trust Company and her son, Arthur, as trustees for her benefit. The Parkmans divorced in 1933. At the time of their divorce, he was a State Senator. That year, he ran unsuccessfully for Mayor of Boston, and in 1940 and he ran, also unsuccessfully, for US Senator. Margaret Rotch Parkman continued to live at 182 Beacon. Arthur Rotch, an investment broker, lived with her until his marriage in April of 1935 to Alice Gedney Storrow. After their marriage, they lived in Milton. Margaret Rotch lived at 182 Beacon until her death in May of 1941. The house was shown as vacant in the 1942 City Directory. On February 26, 1943. 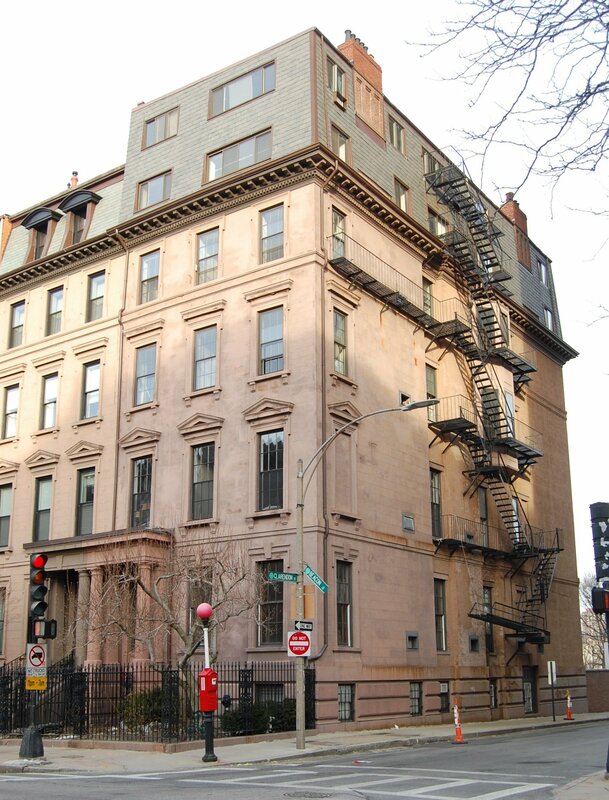 182 Beacon was purchased from Margaret Rotch’s trust by William Karmazine, trustee of the Esdith Realty Trust. In 1943, William Karmazine filed for (and subsequently received) permission to remodel 182 Beacon and convert it from a single-family dwelling into a lodging house. It appears likely that the front entrance was lowered to street level at this point (it had not been lowered in 1942). On January 5, 1945, 182 Beacon was acquired from William Karmazine by John Joseph Donovan and his wife, Lola Lydia (Lippi) Donovan. 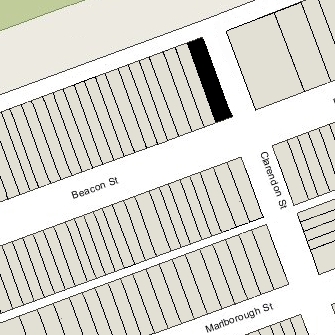 They lived in Roxbury and operated 182 Beacon as a lodging house. He was treasurer of Color-Vision Plastics, Inc.
On July 16, 1956, 182 Beacon was acquired from the Donovans by David B. Kaplan, Samuel Dame, and Nathaniel M. Shone, doing business as K. S. D. Realty Company. On September 17, 1964, 182 Beacon was acquired by real estate dealer Edward L. Britt and his wife, Ann M. (Lynch) Britt. In August of 1964, before taking title to the property, he filed for (and subsequently received) permission to remodel the property into sixteen apartments. In November of 1964 he filed for (and subsequently received) permission to amend the application to replace the existing top floor with two new floors, including replacing the mansard roof with a two-story box-like addition. The remodeling was designed by architect Leon L. Furr. As built, the building consisted of fourteen apartments. On June 10, 1966, 182 Beacon was acquired by Thomas E. Garrity, Jr., and Snelling Robinson Brainard, trustees of Charleside Trust. As part of the transaction, they assumed liability for a mortgage originally given by Edward and Ann Britt to Alton G. Cherney. Alton Cherney subsequently assigned the mortgage to Ann Britt, as trustee of the Symphony Building Trust, and she foreclosed on it, re-possessing the property. On March 15, 1972, Edward Britt, as successor trustee of the Symphony Building Trust, transferred the property to himself as trustee of the 182 Beacon Trust. 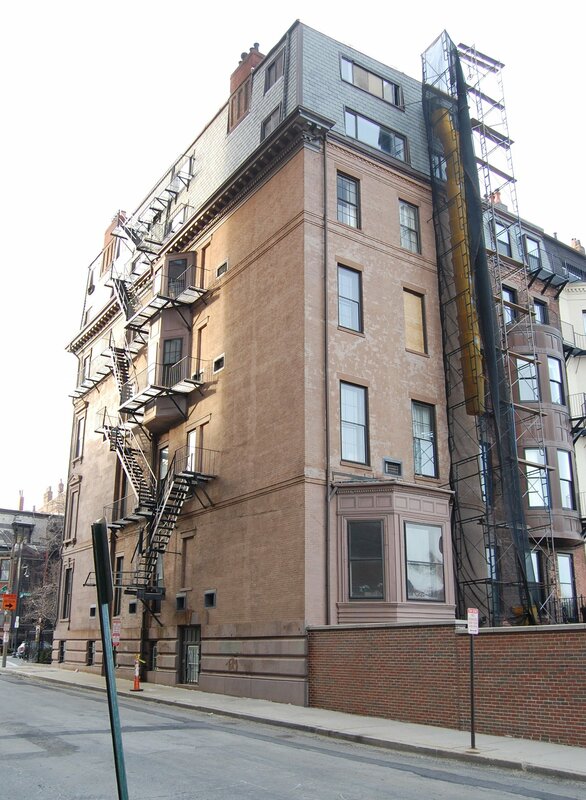 On March 15, 1972, Edward Britt converted 182 Beacon into fourteen condominium units, the 182 Beacon Condominium. On July 11, 2014, the condominium association agreed to reduce the number of units to thirteen, reflecting the combination of two units.